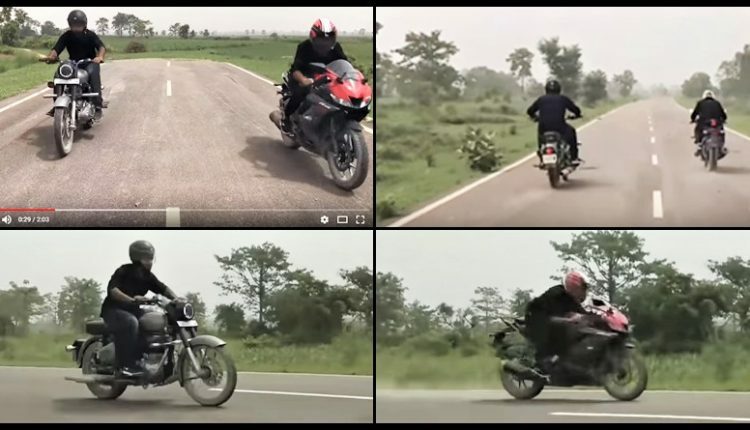 RE Classic 350 vs Yamaha R15 V3: This drag race may feel inappropriate to many cult followers of both bikes but YouTube channel ‘2Wheels 24/7’ has given us an idea of how two different segments of bikes will perform on road in comparison to each other. 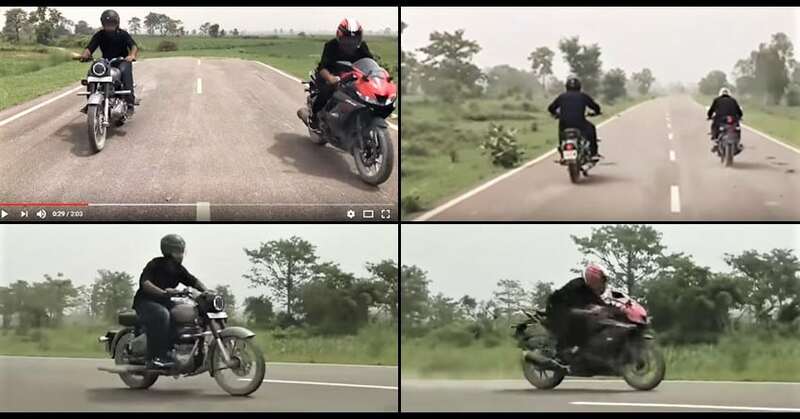 Here we have Yamaha R15 Version 3.0 and Royal Enfield Classic 350, racing on an empty strip of road to see how impressively both brands have managed to channelize the power from these engines to their rear wheels. Yamaha R15 V3 used here is finished in Thunder Grey shade while Classic 350 comes in Gunmetal Grey Edition. The use of this special shade must have helped the rider get more stopping power with the rear disc brake. To keep things under check, different rounds were considered with both riders interchanging motorcycles in these rounds. The lighter body of Yamaha R15 resulted in an impressive start while Classic 350 still proved its mettle with a powerful start for first half of the distance. The difference increased gradually as Yamaha R15 helped the rider achieve higher levels of aerodynamic benefits through its windscreen. On the other hand, Royal Enfield Classic had no such provision and higher weight made it even more prone to wind resistance. Classic 350 is an impressive 346cc machine but weighing close to 200kg makes it slower in comparison to almost 140kg Yamaha R15. This 60 kg of weight difference means the rider needs to have a pillion weighing 60kg on Yamaha R15 to get the weight equation right. Going the other way, shredding 60kg from Classic 350 is next to impossible as the base frame of this motorcycle is heavier and built to last long time on rough roads too. Yamaha R15 V3 comes with a 155.1cc, single cylinder engine producing 19.04 BHP and 15 Nm of torque while Classic 350 offers 346cc engine with 19.8 BHP and 28 Nm of massive torque.